No, nothing to do with lassos and cowboys. Much more gentlemanly than that! 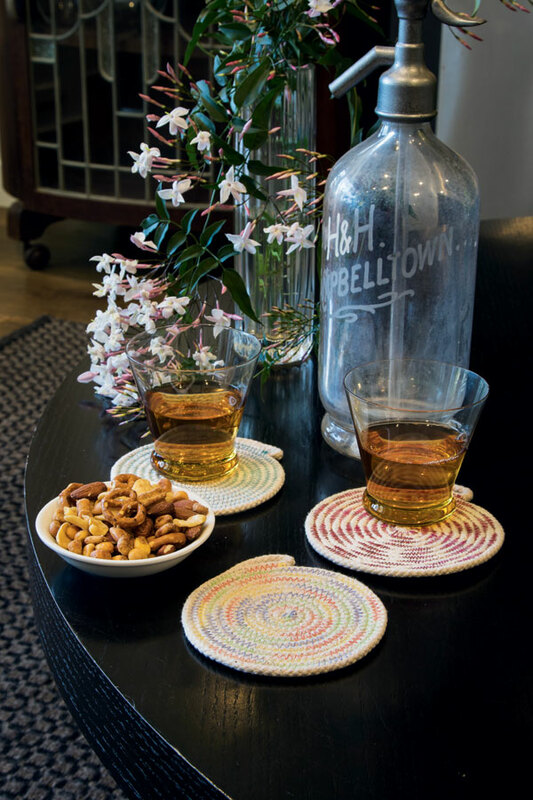 This is simply rope coiling and stitching to create classy club-style coasters. 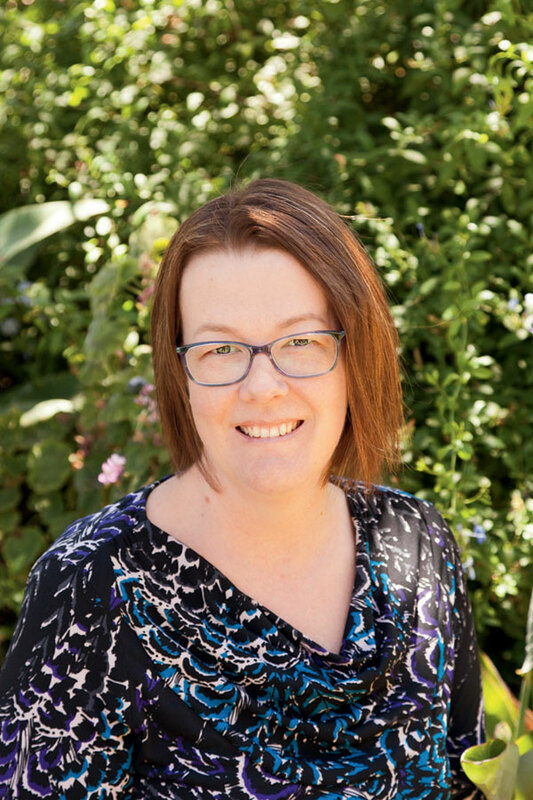 Cassandra Madge shows you the ropes. Finished size: 13cm (5in) diameter approx. Note: Read all the instructions before you start. Rope quantity is approximate and should be used as a guide only: don’t cut the rope until you’re very close to the end of a coaster. Cassandra recommends using the pre-packaged 25m cotton sashing cord from Bunnings for the best value. 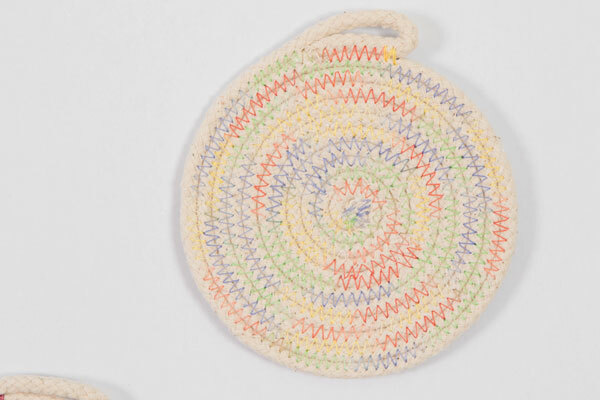 These coasters are great for using cord left over from other projects. Trim the end of the rope if needed to remove any unravelled fibres. Start creating a coil of rope in your hands, making sure it is coiled clockwise so that it grows away from the throat space of the machine, not into it. When you’ve got a couple of spirals, secure the coil with a pin going through all the spirals. Set the machine for a zigzag stitch the same width as the rope diameter and a reasonably short length of about 1.5-2mm (1/16in to 5/64in). Delight in the Dresden Plate Placemats pattern by Ali Phillips! Put the coil under the presser foot and start sewing slowly around the coil from the centre outwards, catching the loose end and bringing each consecutive spiral together. The foot should lie across two adjacent spirals with the needle penetrating each one in turn. Cassandra says that this initial stage is very fiddly and takes patience, lifting the foot and pivoting the coil bit by bit. To do this, stop with the needle down in the left-hand inner spiral when pivoting, as this lessens the amount the stitching overlaps and minimises the build-up of thread. After a few rotations, the coil will become easier to handle. 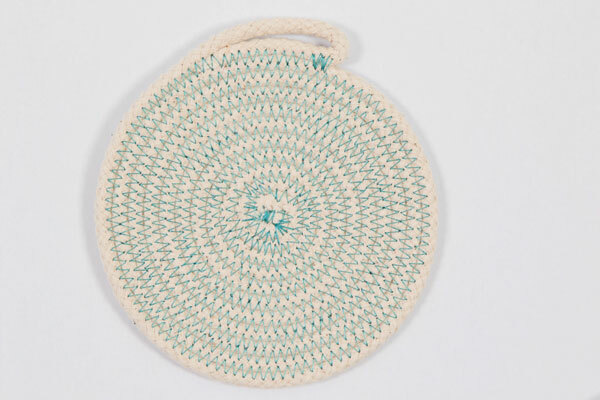 Continue sewing around in a flat coil until the coaster is your desired diameter. Cassandra finished her coasters with a loop. To do this, cut the end of the rope at a 45-degree angle. Fold it back along inside the spiral, choosing how long and high you want the loop to be. 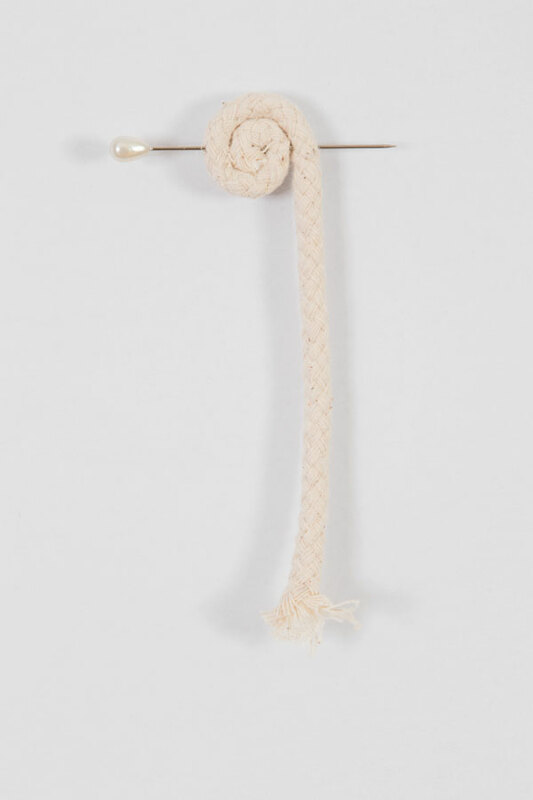 Pin through the unstitched rope, raw end and the edge of the coaster to hold it firmly in place. Stitch over this section, bringing the three layers together where they meet. Stitch along to the end of the loop to attach it to the edge of the coaster and reverse to finish it securely. Trim the thread ends neatly. Turn your afternoon cuppa into a special occasion with this pattern! 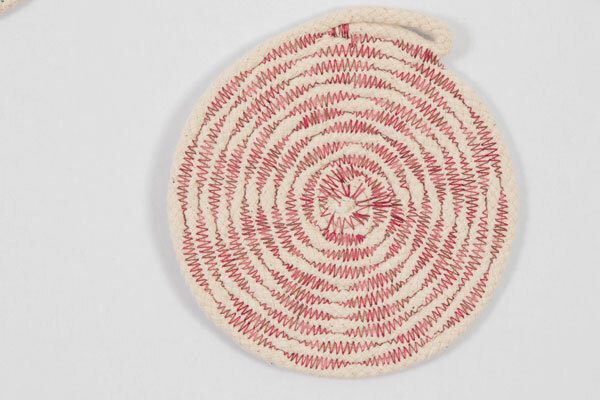 Red coaster is sewn with a programmed bead stitch set longer than usual. 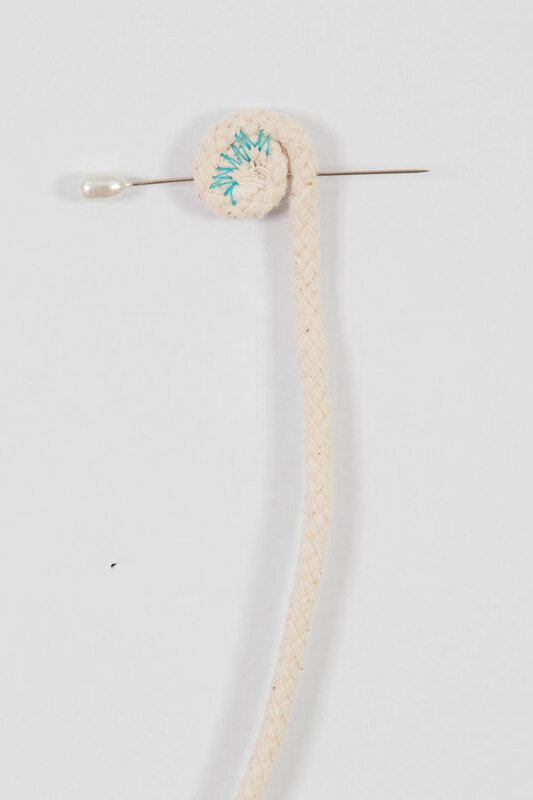 Multi-coloured thread pops against the neutral rope. Experiment with various types and colours of threads – metallic, embroidery and variegated for example – to give different effects. 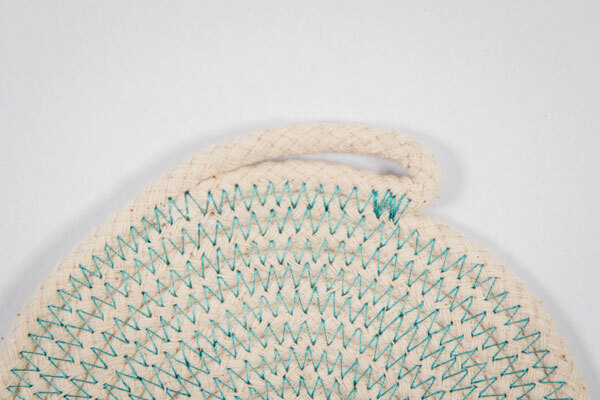 You needn’t stick to plain zigzag stitch either – you can try out other fancy stitches that go back and forth from left to right. Cut a couple of lengths of the rope and test out different threads and stitches in a straight line first. Starting the coil in the middle can be a bit messy. If it gets too ugly, rather than abandoning it, just glue or stitch a small circle of felt or fabric over the centre and treat it as a design feature. Why this particular craft? I can’t seem to see anything without trying to make it. I love my sewing machine and the amazing variety of things it can create – home decor, soft toys, quilts and clothes. Although zips and I will never be friends! Have you tried plenty of others? I’ve been creating with my hands for as long as I can remember. I’ve tried so many crafts and will always have a couple of projects on the go. I love the process of making things, especially for my family and loved ones. The best part is enjoying the finished product and the happiness that it brings others. I knit, crochet, quilt, cross stitch, paper and digital scrapbook and I have a huge passion for photography, both landscape and portrait. I haven’t met many crafts I don’t love. Any good stories from crafting lessons? My mother used to tell me the story of when my grandmother taught her to sew doll clothes. She patiently watched her stitch up the side seam, across the sleeve hole and over the shoulder. Sometimes, allowing people to make their own mistakes is a stronger lesson than jumping in and correcting them all the time. What’s the biggest stitching mistake you’ve ever made? I honestly can’t think of one. I try not to focus on mistakes, and I look at them as design opportunities or simply design choices. I craft without regret; even if you make a mistake, you can always turn it into something else in some way. What is your advice for beginners? Don’t compare your beginning to someone else’s middle. Everyone starts from a different place and we were ALL beginners once. Listen to expert advice, but remember that there is always more than one way of doing something. If a technique doesn’t work for you, play around until you’re comfortable with what you’re doing. Craft for yourself and your own enjoyment, not the ‘quilting police’.